Fusion Tattoo Ink- As evolving artists, we are compelled only to use the highest quality pigments, tattoo machines, tattoo machine tubes and needles to better enhance your tattoo and your tattoo experience. Besides the tubes and needles being sterile used one time and throw away for your safety, we only use the best tattoo ink pigment. Going the extra mile is part of what we do to ensure your safety and the quality of the final tattoo. 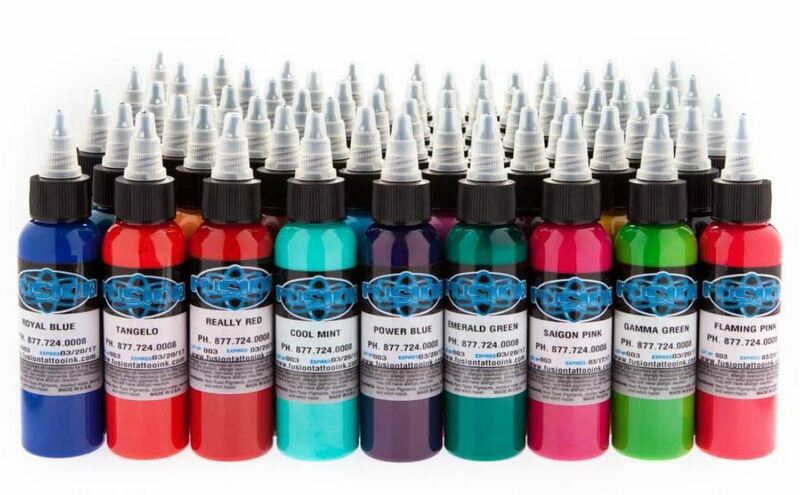 As with every facet of our work, only the highest quality tattoo ink pigments are used to ensure the quality, brightness, health, and longevity of your tattoo. We’ve been doing tattoos since 1992 and have constantly been on a quest for the highest quality and safest inks for your tattoos. We have come a long way in health and safety! Our pigments are produced by artists for artists from Fusion Tattoo Inks. Fusion Ink has a much greater pigment load than any other ink on the market today and is an organic pigment that is completely vegan safe. Fusion Ink is not packed with fillers as are a lot of inks on the market today. You will see and feel the difference. Don’t just take our word for it, just take a look at some of the work was done by the top tattoo artists who now use Fusion Ink. Once you try Fusion, you will know the difference, and your tattoos will tell the story.